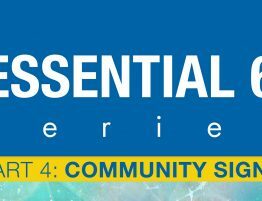 Top Ten Clubhouse Scents for the Season | Robinson Creative Inc. I find one of the most interesting things about Millennials is that even though technology is a part of their every fiber, they long for the past. Maybe it’s because of our current turbulent society or during their formative years, terror struck us to the core. They retreat to the safety and security of the past. During the holiday season, this is more reason to decorate and make merry with rich nostalgic touches and warm holiday scents. There are many ways to set the mood for the season. Let’s talk about scents. There is no better way to enliven an office or large clubroom lobby than with fragrant cinnamon and cloves or the scent of gingerbread cookies. Our sense of smell is our strongest connection to the past. You may walk into a bakery and you are immediately whisked back to your grandmother’s kitchen where she was baking fresh bread or her famous pie. Setting the atmosphere with holiday fragrances is your first step to creating some seasonal magic. Candles require some maintenance, but they’re the best way to create a holiday effect. Use scented candles in a variety of shapes throughout your clubhouse. Stick with one scent per area. You may want a cinnamon cider aroma in the lobby but warm vanilla sugar cookie in the clubhouse. Scents that remind your guests of holiday baking are likely the best. Then, as it gets closer to Christmas, switch to pine and mint-inspired. 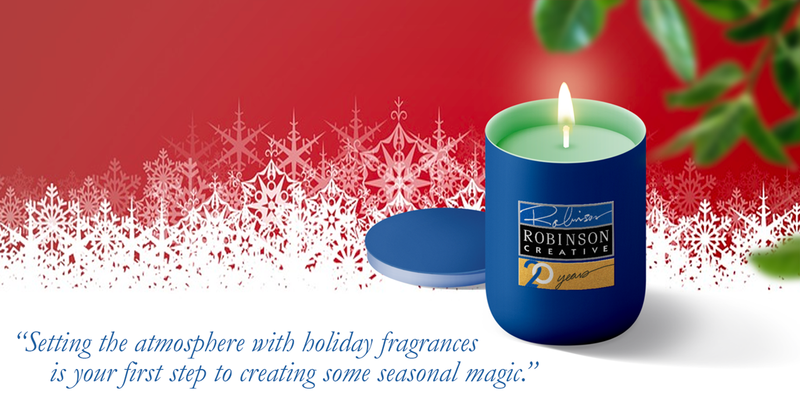 The fragrance combined with the glow of the candles are unmistakably holiday. But make sure you check your wicks! They should be cut every three to four hours, so they don’t get too long and smoke. Decorate around your candles with garland, classic toys and always have a plate of goodies nearby. So, ring in the season from November through December with the perfect bouquet. Candles are only one. 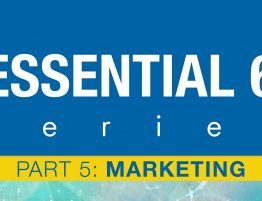 Essential oils, scented heated wax, air fresheners, sprays… there are multiple options. But the flickering glow of a small flame combined with the smells of the holidays is a divine pairing. There are some aromas that become signature scents instantly. 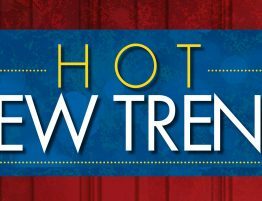 Here are some of our favorite candles to light up the weeks ahead! This candle is the essential scent that is guaranteed to instantly raise your holiday spirits. It is also our favorite candle in the bunch. For the last three Christmases, my family doesn’t start the holidays without it! 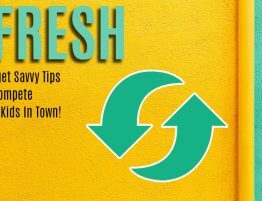 This stand-alone scent creatively combines pomegranate, mandarin orange, pine, cloves, and cinnamon with a hint of vanilla and amber. The result is warm, and a traditionally comforting. However, the new Nest Sugar Cookie should also be considered! With notes of warm vanilla, bourbon, and caramel, it brings grandma’s Christmas kitchen to your home. Just don’t blame us for the holiday sweet tooth that will follow! 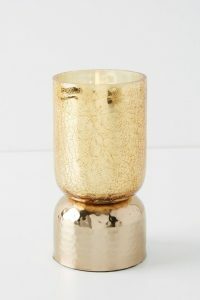 This beautiful candle, housed in a luxe gold vessel, lends a touch of elegance to its surroundings. Anthropologie takes pride in their curated collection of candles. Carefully choosing from many brands, each hand poured candle has a season and space in mind for you to brighten your surroundings or to specifically select as a gift. Created for a cultured woman who cherishes the classics, Anthropologie candles celebrate a wide range of clients. They are meant for a woman who has her own sense of style and knowledge of what she wants. Our favorite for this season is Apple Spice: fresh apple, sweet pear, and juicy orange sparkle with nutmeg clove, cinnamon, and allspice, and sweetened with brown sugar, this candle surrounds you with the feeling of being home. 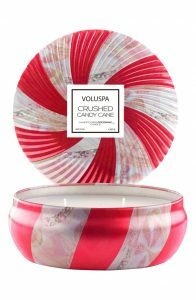 Candy Canes are an essential part of Christmas and what could be a better than this limited-edition 3-wick candle? 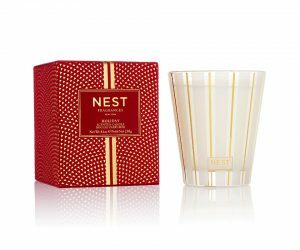 The swirled red and white pattern in a glass vessel brings both the sight and scent of the season with a top of peppermint, a middle layer of sugar cookie and vanilla bean as a base. These candles are sure to be a hit in your clubhouse. Voluspa candles are hand-poured in the United States from sustainable, ecologically sound, pesticide-free manufacturing and never tested on animals. The founders have vast experience in creating unique combinations of fragrances that use the finest ingredients discovered as they have explored the globe in search of the best. The company name, Voluspa, is from a Norse poem about the creation of the world from chaos. 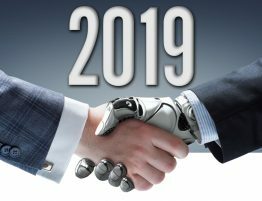 The owners feel this exemplifies the company growth from their home in California over 2 decades ago to a product that promises luxury and excellence. Capri Blue pairs visuals and scents in an intoxicating blend to delight the senses. Designed and poured in Mississippi these soy-blended candles are created to reach the discerning individual who seeks something that appeals to a person who loves to be outdoors. 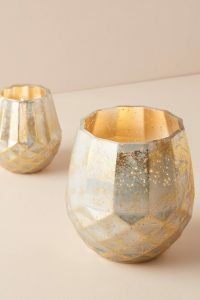 These are among the favorite candles at Anthropologie. The Fir & Firewood candle has a fruity, green aroma of apple, combined with clove, fir, pine needle, white birch, cedar, vetiver, and musk. Remember to keep your wick trimmed and keep the wax pool free of debris for a woodsy rather than smoky effect. Tory Burch initially grew an awareness of a sense of style from her parents who loved to dress with panache while entertaining and traveling. After gaining an Art History degree and working for designers Ralph Lauren, Vera Wang and Narciso Rodriguez, Tory moved on to create her own boutique and has since expanded to shops abroad. Tory Burch now signifies a touch of easy elegance in a wide range of products from her signature clothing to stylish accessories. 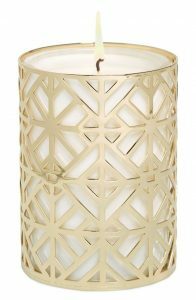 We have fallen in love with this elegantly deco geometric pillar candle. Warm and wintry notes of cedarwood, violet, and amber create just the right ambiance for your home, office, clubhouse or reception area. The Golden Chestnut Classic is a limited-edition holiday candle with an enticing aromatic blend of balsam, pine needles and exotic spices, including lemon zest. Warm chestnuts and hazelnut cream provide the heart and the depths are a superb mixture of white cedar, cistus, patchouli and vetiver. A touch of vanilla sugar brings a sparkle to the overall effect. LAFCO candles and luxury go hand in hand and the handblown art glass vessel gives this a perfect look to fit in with your holiday décor. Many candles are made entirely from paraffin, but their wax blend is majority soy, which is naturally derived from vegetables and 100% biodegradable. 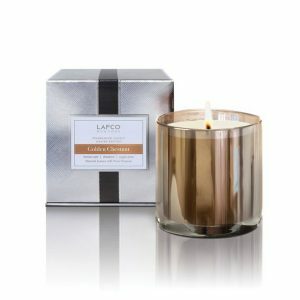 Hand poured in the USA with up to a 50 hour burn time for the classic candle and up to 90 hours burn time with the Lafco Signature 15.5oz Candle, this is an item you will want this holiday season for your clubhouse or reception area. Minnesota is the home of Illume Candles. A collaboration of calligraphers, illustrators, painters, writers, designers, sourcing geniuses, chemists, mixers and wick straighteners who pour their own ideas into finding the perfect fragrances, then refine it all into something extraordinary. Each signature scent is crafted by hand with the purpose of creating an inviting product. Balsam & Cedar provides a warm woodsy aroma spiced with orange, berries, cinnamon, fir and pine. With the flickering light reminiscent of a campfire, you will be transported to the country without ever leaving the comfort of your apartment… or the clubhouse. 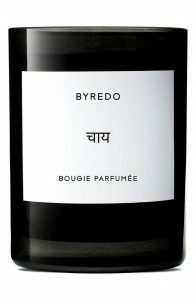 Proving that the memory of visits to our grandparents is often triggered by certain scents, the Byredo Chai Candle is connected to founder Ben Gorham’s memories of his grandmother’s house. Inspired by the tea rituals of India, Chai represents the warm, spicy black tea which is infused in boiling milk. As more people embrace chai tea as a warm comforting beverage, this candle is sure to spark similar feelings of comfort as we inhale the tantalizing aroma. • Base: birch tree, warm latte, guaiac wood. 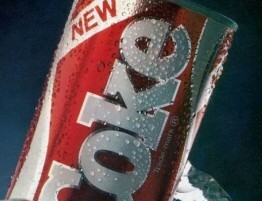 Try it today for the nostalgia it brings to many of their homes or as a new tradition for yours. It’s perfect if used in an area used by people of many backgrounds and cultures as we each celebrate our own special traditions. The Forest Collection is a warm and spicy treat that sends your senses to an outdoor setting and reminds you of a perfect Autumn day. There are layers of textured woods with hints of star anise, and even black pepper, for a uniquely pleasant scent that seems both familiar and comforting. 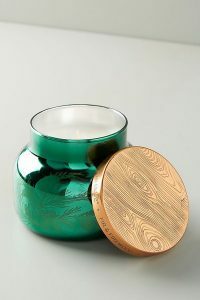 Contained in a metallic rose-gold vessel with an etched wood lid, this candle fits in perfectly with a study or office and fills your space with a welcoming aroma. 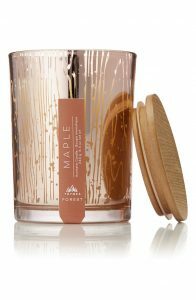 Forest Maple by Thymes is a paraffin wax candle with non-metal wicks that provide a clean, pure burn time of approximately 60 hours. We also love that for every Forest candle sold, a portion of the proceeds will be donated to American Forests. A gift that gives back is very welcome this time of year. 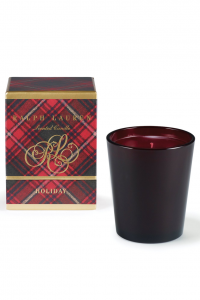 The Ralph Lauren Holiday Classic Candle is exactly what you expect. This is a traditional, elegant, festive candle in a reusable ruby red glass vessel. The blended scents of evergreen, red currant, and juniper berry bring back the memories of holidays past and present but offer a hope that some things remain the same. The holiday season is almost always nostalgic and the various scents we association with them make up our memories… which is a part of who each of us is today. 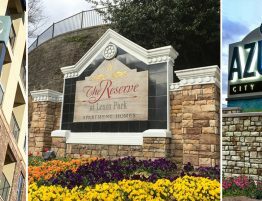 The Ralph Lauren Holiday classic and the look of times gone by yet have a timeless quality to them that makes them perfect with any modern setting. Some styles simply fit in anywhere and are a must-have. Everyone in the clubhouse will enjoy the memory-provoking aroma that is still is as fresh as ever.